Superheroes are awesome. It’s always fun to wear your favorite apparel featuring your favorite comic book characters like Batman, Superman, Joker etc. Unfortunately, however, there are times when you need to dress up and can’t display your nerd credentials so proudly. Whether it be for work or some sort of special occasion, you’ll probably be required to dress up from time to time. Don’t worry, we have a solution for you to add some geek style to your formal wear. 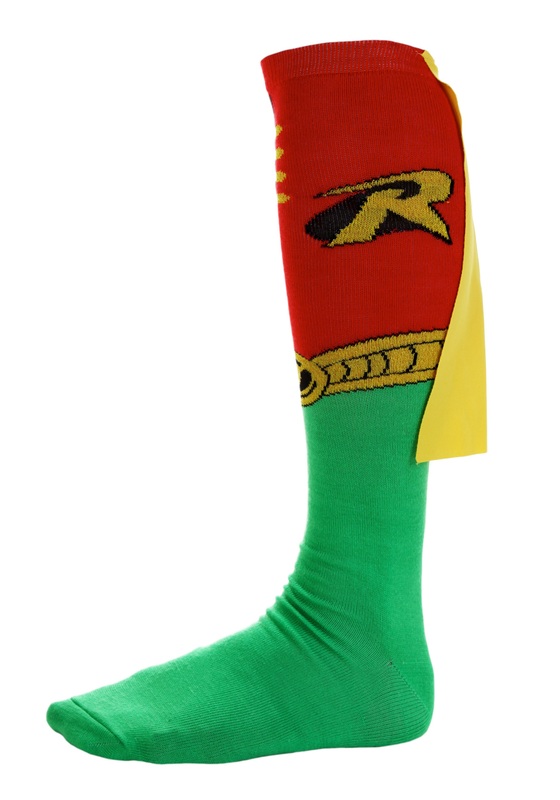 These Robin superhero socks can be worn under any pair of normal pair of pants without notice (kind of like a secret identity for your feet). The socks feature the red and green of Robin’s classic uniform with a belt print, Robin’s logo, and even a cool yellow cape! Even when you have to dress up, show some love for one of your favorite DC comics characters with these Robin socks.